We’ve been seeing a number of older games getting the Nintendo Switch treatment this year; everything from big AAA efforts in the form of DOOM and The Elder Scrolls V: Skyrim to smaller indie projects like Stardew Valley and now Stick It To The Man. These familiar releases are great as they offer another opportunity for newcomers to give them a try while returning fans have the chance to experience them in a whole new way. First released way back in 2013, Stick It To The Man makes its second appearance on a Nintendo system (the Wii U would get its own version the following year) but does this dark and twisted journey still hold up? You play as hard-hat tester Ray who following a head-related incident suddenly finds himself with a pink spaghetti arm spouting from his noggin. It’s a very odd spectacle but one that also bestows Ray with the ability to not only fold and tear the environment he walks but also read minds of bystanders. Unfortunately, these new powers have drawn some unwanted attention too from a shady individual known only as ‘The Man’ who frames poor Ray for a crime he didn’t commit. On the run, you’ll now solve puzzles and avoid capture across ten weird and wonderful chapters. Each chapter in the game brings with it a new area to explore, characters to interact with and of course puzzles to crack. Your cranial abilities will aid you on your adventure, roadblocks often passable through reading the minds of others, retrieving their thoughts (which can appear as physical items) and using them in the real world. One such example had me slapping a set of sharp teeth on a little dog in order to use him to scare away a duo of sketchy looking thugs with guns. You’ll also need to manipulate the world around you too by literally stripping its cardboard foreground that may be hiding secrets behind. Stick It To The Man is no pushover when it comes to its puzzles especially later in the game. While solutions are relatively straightforward in the opening chapters, things become more difficult as the story progresses. Items no longer appear instantly obvious in their use while the stages themselves grow in size and complexity too. I’ll admit there were situations where I found myself stuck and struggling for an answer, which would bog down the already slower pace of the game. These instances were never too frequent to ruin my experience, however. Talking to the world’s inhabitants and reading their thoughts play a large role in Stick It To The Man, where even one overlooked individual might lead to you missing a key item that may help you. The writing and voice acting are solid across the board thankfully, characters quirky and outright crazy with vocals to match. Some locals had me raise a smile with their wacky antics while Ray himself comes off as a very likeable lead. It’s hard not to feel for the guy since he’s just someone who just happened to find himself in the wrong place at the wrong time. In fact, this is very much a game where a majority of its enjoyment comes from the amusing dialogue and interactions with its characters – something that may not be to everyone’s tastes. This is a slower paced experience that will see you retreading the same ground, grabbing items and experimenting with them, trying to find the right use or right person. While it’s not necessarily a bad thing, its something to consider if you’re not so into your point and click adventure-type games. Outside of solving puzzles Stick It To The Man does include light elements of platforming. While you’ll be required to run, jump and launch yourself between pins to generally get around each chapter, you’ll also need these skills to outrun enemies. With no means to defend yourself, you’ll constantly need to be on the lookout for goons eager to zap you with their guns. Keeping one step ahead starts off as a fun alternative to the slower paced puzzle-solving moments, however, it isn’t long before you start to grow weary of constantly running for my life every time danger is near. While the punishment for getting caught is never more than booting you back to a nearby checkpoint, getting hung up on the same area of goons can grow tedious. The world of Stick It To The Man is striking in its appearance, everything made up of cardboard in an almost diorama manner. This style proves especially clever when leaping between layers in the environment or removing panels. Whether playing on the big screen or handheld these visuals remain clear and crisp. 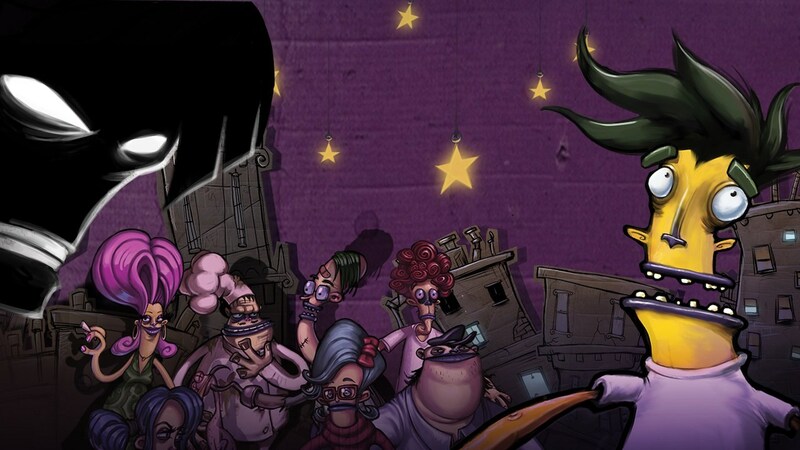 Stick It To The Man delivers an unexpectedly dark but often funny experience that’s unlike anything currently on the Nintendo Switch. While the puzzles can sometimes border on frustration and the pacing isn’t for everyone’s taste, the journey taken is one full of witty and memorable highlights point and click fans won’t want to miss. Review copy provided by Zoink!